The world record in the marathon could be broken on April 13 at the Virgin Money London Marathon. Indeed, the organizers announced a record plateau for this year with the participation of the best runners. An competition which will live the participation of double Olympic champion and four times world champion, author of numerous world records, Haile Gebrselassie! At five days to his 41st birthday, the Ethiopian will be the pacemaker of the marathon. 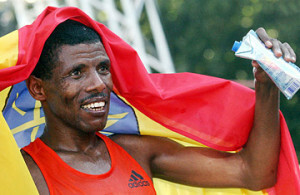 “We are delighted to announce that Haile Gebrselassie has agreed to act as a pacemaker in the race this year,” rejoiced Monday director Hugh Brasher of the race. This is the first time a former world record holder will play the role of pacemaker on an international race. Author of 27 world records (track and road), Gebrselassie will print the pace of 42.195 km London until kilometer 30 before leaving the competitors who will launch an assault on the world record. “Everyone knows how difficult it is to beat the world record on the London Road (…) But with Haile as hare and four fastest marathon runners, there is a real chance that we witness something special,” says Brasher. Owner of the new reference time, the Kenyan Wilson Kipsang will race. He will suffer challenge from compatriot Emmanuel Mutai- holder of the best time in the marathon London – , 2h 04 min 39 sec , the Ugandan Stephen Kiprotich, world champion and Olympic marathon champion, Ethiopian Tsegaye Kedebe – London marathon defending champion in 2 h 06’04 ” – and British double Olympic champion Mo Farah.